After not being able to travel for 4 months, we spontaneously decided to rent a car and head from London to Cotswolds – an incredibly beautiful place in England. Cotswolds is all about the idyllic countryside, picturesque villages and toy-like houses. So if you’re dreaming to see real English villages with cute houses that look straight from a fairytale, Cotswolds is your destination. To be honest, I didn’t expect Cotswolds to be so beautiful and I also really liked our 1-day Cotswolds itinerary, so I would love to share it with you in this post. Do you like road trips? We love them! We drove from Edinburgh to the Scottish Highlands and in summer 2017 went from Edinburgh to Oban and the Isle of Skye as well. Honestly, I think that 1 day is not enough for Cotswolds and I wish we could do a weekend trip to this beautiful place instead (given the fact that it was in October and it was getting dark around 5:30 pm already). If you’re visiting in summer and leaving for Cotswolds early enough, it should be okay. In order to explore Cotswolds properly, you would need either a car (book it on Avis.co.uk if you don’t have one – that’s where we always book cars or book a tour to Cotswolds. There are, of course, trains and buses to Colchester or Cirencester, however, once you get there, it’s problematic to get to all the small villages and places of interest without a car. In order to get from London to Cotswolds, you would probably need around 1.5-2.5 hours, depending on where in Cotswolds are you heading and from where in London are you leaving. It’s quite easy to start exploring Cotswolds from Cirencester. Cirencester is the capital of Cotswolds, it’s a very beautiful and colourful town. We were lucky because on Saturday, there was a market on the main square and we bought some amazing local produce, such as honey and beers. It’s very hard to find a parking in Cirencester. Before finding a spot, we actually drove through 3 parking – there were absolutely no places. That means the town is full of visitors. From Cirencester, you can head to the Westonbirt Arboretum (if you aren’t a huge fan of parks and botanic gardens, you can skip this one). It’s especially beautiful in Spring and Autumn – because of the blossom and the colourful leaves. Later, you can visit Castle Combe and Bath. For Bath, you would easily need half a day or even a day, but if you spend there an hour or two, you can get some overall impressions! We didn’t go to the Roman Baths – the queue was simply too long, but we walked around the city and took some nice photos! Some other charming place that you need to visit is the village called Bibury. We couldn’t find a parking space there, as there was a wedding and absolutely everything was occupied, however, we toured the village 3 times and it looked amazing! Later, I recommend you head to Bourton on the Water – a charming town with a huge parking (yay), so there we could finally stop. The only downside of Bourton on the Water is the fact that it’s really crowded, like REALLY. It wasn’t possible to take photos on any of the cute tiny bridges (because on every single bridge there were at least 50 people). After visiting Bourton on the Water, we drove to Lower Slaughter. The journey only took 7 minutes, since both Slaughters are very close. Why both Slaughters? Well, there are two villages with the names Lower Slaughter and Upper Slaughter. Don’t be scared – nobody will kill you there. The name actually means wetland or muddy place in Old English. If you have enough time (unfortunately, we didn’t) you can walk a very picturesque path connecting The Slaughters. We also visited Stow-on-the-Wold, but unlike all the other places, this one wasn’t impressive at all, so we only spent about 20 minutes there. I wouldn’t recommend you stopping there, to be honest. Straight from the Stow-on-the-Wold, we went to the birthplace of Shakespeare – the Stratford Upon Avon. This place is definitely one of the cutest and most impressive towns (cities) in England, because of its authenticity and unique architecture. All the houses are well preserved and look like they came to us straight from the 16th century. Most of the houses are black & white with Tudor-style frontages and look very similar to German medieval towns (has anybody been to Zelle? It looks very similar). Since we arrived at Stratford after 5 pm, all the museums were already closed, but we still managed to walk around the city before it got dark. If you have an option of extending your trip to a weekend trip to Cotswolds and would like to stay overnight there, here are some great lodge and B&B options for a dreamy stay in Cotswolds. Here are some of the best places to stay in Cotswolds: Lowerfield Farm, Pytts House Boutique B&B, The Old Post Office and a slightly more expensive option: the Painswick. 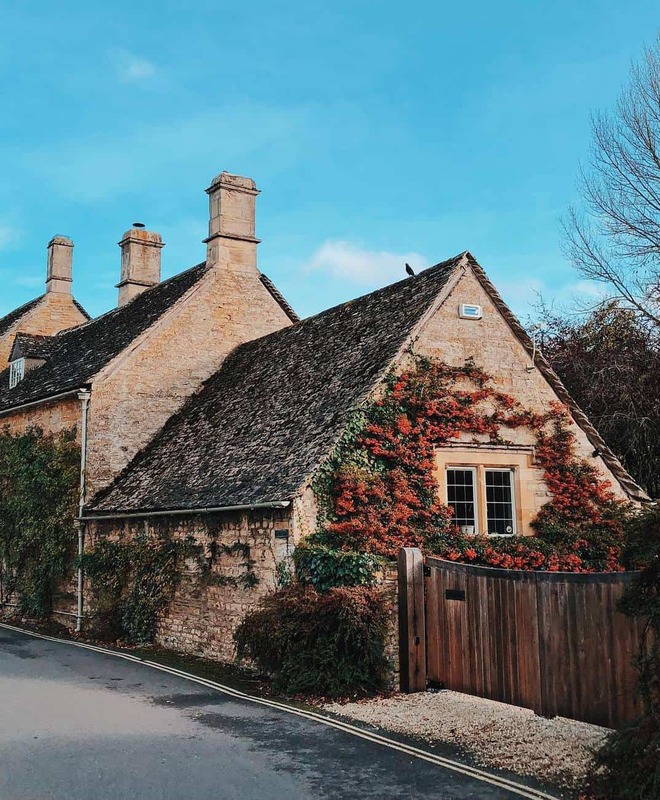 To be honest, I feel like just one day in Cotswolds wasn’t enough because there are so many other nice cute villages that deserve a visit, however, if you only have one day, it’s enough to get the overall impression of Cotswolds. It wasn’t hard at all to get from London to Cotswolds, however, you need to wake up very early in order to cover as many places as possible! I enjoy filming and editing videos, so of course, I filmed one in Cotswolds: feel free to check it out and leave a comment below! Don’t forget to check our post about the most beautiful place in England – Seven Sisters Country Park! Liked this post about what to see in Cotswolds, England? 1-day Cotswolds itinerary from London to Cotswolds! Share it on Social Media!